Designer Series Paper on Tool Tip Tuesday! Pick up a piece of Stampin' Up! cardstock and notice the exclusive colors, impressive thickness and that it's dyed all the way through so there's no white core. Our cardstock is acid and lignin free so it's great for scrapbooking. Get exclusive artwork and colors in our exclusive double-sided paper. These packages of 12" x 12" designs are a great choice for scrapbooking, banners, card making, gifts and more!! These colors are designed to coordinate with our ink colors. I can't tell you HOW much I LOVE our amazing paper lines! From Vintage to Modern we are sure to suit all styles and needs! Go ahead, CLICK HERE and see some of my many projects and tutorials using our Designer Series Paper. 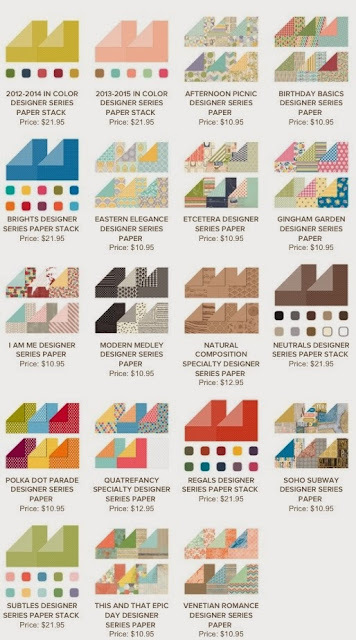 Leave me a comment and let me know what paper is YOUR Favorite and which project YOU Like! Pick a PRIVATE CLASS and You can Pick the Paper, Stamps, Techniques that interest you while earning amazing Hostess Benefits! !